FABP is a newly introduced plasma marker of acute myocardial infarction (AMI). The plasma kinetics of FABP (15 kD) closely resemble those of myoglobin in that elevated plasma concentrations are found within 2 hours after AMI and return to normal generally within 18 to 24 hours. But the concentration of FABP in the skeletal muscle is 20 times lower than in cardiac tissue (for myoglobin the same content for cardiac and skeletal tissue), that makes FABP to be more cardiac specific than myoglobin. This makes FABP a useful biochemical marker for the early assessment or exclusion of AMI. FABP also appears to be a useful plasma marker for the estimation of myocardial infarct size. 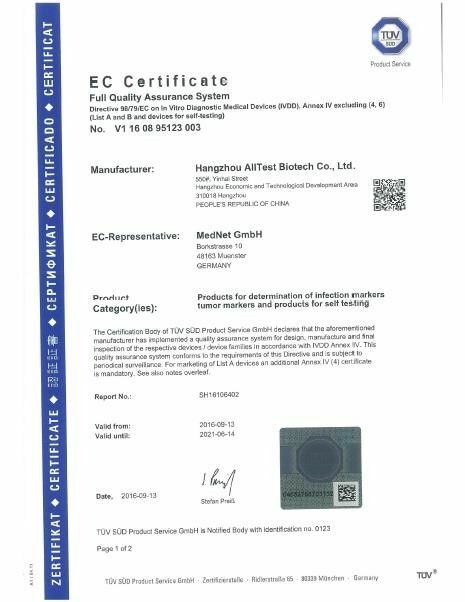 FABP is suitable for use as a standard in immunoassay for early detection of acute myocardial infarction, immunogen for antisera production, mass FABP standard, FABP biochemical and immunochemical studies, tracer for iodination. Cardiac Troponin I (cTnI) is a protein found in cardiac muscle with a molecular weight of 22.5 kDa.1 Troponin I is part of a three subunit complex comprising of Troponin T and Troponin C. Along with tropomyosin, this structural complex forms the main component that regulates the calcium sensitive ATPase activity of actomyosin in striated skeletal and cardiac muscle. After cardiac injury occurs, Troponin I is released into the blood 4-6 hours after the onset of pain. The release pattern of cTnI is similar to CK-MB, but while CK-MB levels return to normal after 72 hours, Troponin I remains elevated for 6-10 days, thus providing for a longer window of detection for cardiac injury. The high specificity of cTnI measurements for the identification of myocardial damage has been demonstrated in conditions such as the perioperative period, after marathon runs, and blunt chest trauma. cTnI release has also been documented in cardiac conditions other than acute myocardial infarction (AMI) such as unstable angina, congestive heart failure, and ischemic damage due to coronary artery bypass surgery. Because of its high specificity and sensitivity in the myocardial tissue, Troponin I has recently become the most preferred biomarker for myocardial infarction. 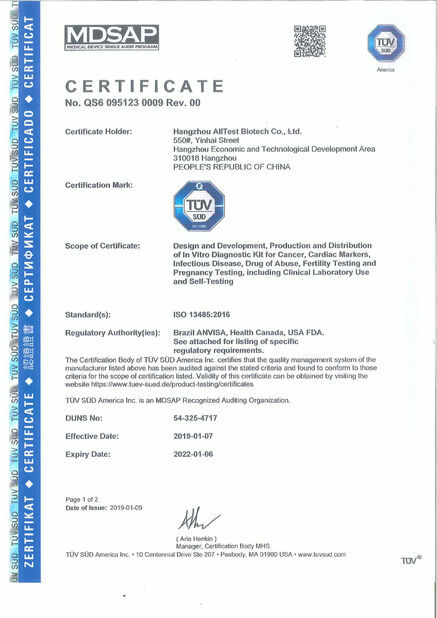 test that utilizes a combination of antibody coated particles and capture reagents to qualitatively detect H-FABP and cardiac Troponin I (cTnI) in whole blood, serum or plasma. The minimum detection level is 8 ng/mL H-FABP and 0.5 ng/mL Troponin I. Place the cassette on a clean and level surface. For Serum or Plasma specimen: Hold the dropper vertically and transfer 2 drops of serum or plasma (approximately 50 mL) to the specimen area, then add 1 drops of buffer (approximately 40 mL), and start the timer. See illustration below. For Venipuncture Whole Blood specimen: Hold the dropper vertically and transfer 2 drops of whole blood (approximately 50 mL) to the specimen area, then add 1 drops of buffer (approximately 40 mL), and start the timer. See illustration below. 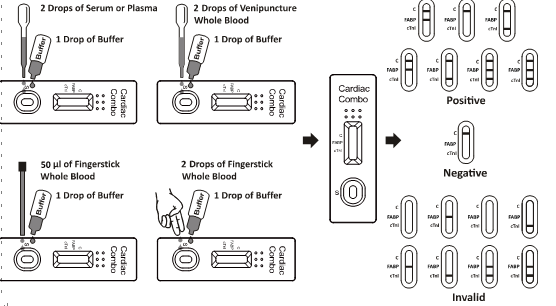 For Fingerstick Whole Blood specimen: To use a capillary tube: Fill the capillary tube and transfer approximately 50 mL of fingerstick whole blood specimen to the specimen area of test cassette, then add 1 drop of buffer (approximately 40 mL) and start the timer. See illustration below. 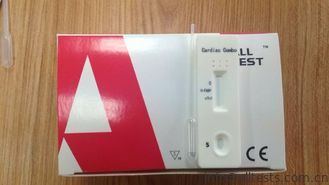 To use hanging drops: Allow 2 hanging drops of fingerstick whole blood specimen (approximately 50 mL) to fall into the specimen area of test cassette, then add 1 drop of buffer (approximately 40 mL) and start the timer. See illustration below. POSITIVE:* A colored line in the control line region (C) and the presence of one or more colored lines in the test line regions indicates a positive result. This indicates that the concentration of H-FABP and/or cardiac Troponin I is above the minimum detection level. *NOTE: The intensity of the color in the test line region(s) will vary depending on the concentration of H-FABP and/or cardiac Troponin I present in the specimen. Therefore, any shade of color in the test line regions should be considered positive. NEGATIVE: One colored line appears in the control line region (C). No line appears in the test line region (T).This indicates that the concentration of H-FABP and cardiac Troponin I are below the minimum detection levels.